- Private, duo (2 students) and mini-class lessons. Founded in 2015, F for French is a pool of certified and highly experienced teachers all working at the University or in establashed language schools in Paris. 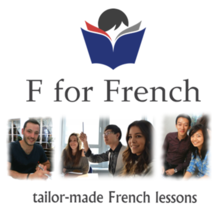 The cornerstone of F for French tailor-made teaching. One-on-one lessons with specific content and language targets. Two-on-one lessons allowing you to practice your French with another student of the same level. Small classes (3-8 students) running all year long for every level (elementary, intermediate, advanced). Before starting any new course, a teacher of F for French will assess your level, needs and wishes during a 20 to 30mn interview. As your referring teacher, he will guide you through your learning process and provide you with a tailor-made program. Although strong focus will be laid on oral interaction through a wide set of speaking/listening activities, the main focus of F for French is to provide you with relevant teaching, taking into account not only your language skills but also your profile and specific needs in French. Your referring teacher will use and/or create tailor-made teaching material to best accommodate your learning. Feel free to tell him/her about whatever language aspect you wish to put extra work on.